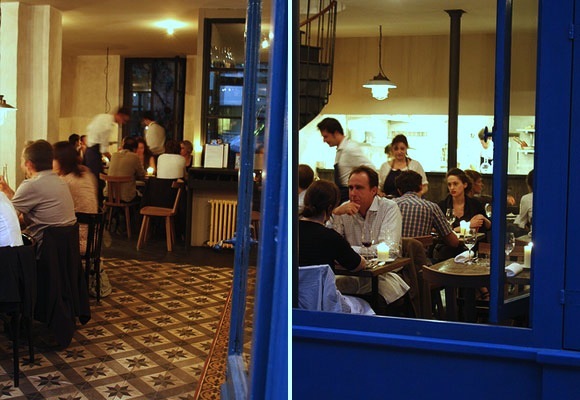 In April, the Paris food scene saw the grand return of creative culinary prowess with the opening of Septime, a modern bistro in a remote corner of the 11th arrondissement that breaks free from the confines of traditional French cooking. Buzz about the high-caliber restaurant was instantaneous and spoke largely of the mastermind behind the apron. After a tenure at L’Arpège under the auspices of Alain Passard, Bertrand Grébaut went on to snag a Michelin star at Agapé at only 27 years old. Earning himself even further attention was the 10,000€ Evian-Badoit grant he was awarded to bring his own venture, Septime, to fruition. Innovative, successful and under 30 – my friends and I were intrigued. The moment we entered the restaurant, we were greeted with warm, sincere smiles and glowing enthusiasm from devilishly handsome young servers. We were seated in the entry dining room, across from the bar where the evening’s first guests chatted gleefully over a glass of wine. 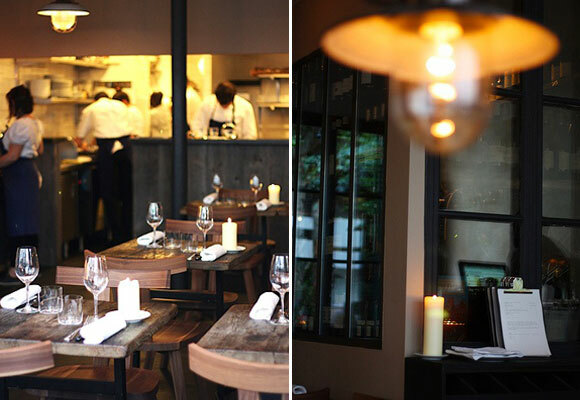 It features one long communal table and is slightly quieter than the larger room just beyond the glass partition that offers a view of Grébaut and his team hard at work in the open kitchen. Before even glancing at the menu, we were transfixed by the post-industrial décor, hanging lamps (which we later learned were from Holland) and the rustic, unrefined wood tables throughout the restaurant that provided the warmth and sophistication missing from the neighborhood. Passersby must have felt similarly because most stopped in front of the restaurant, with its wide-open windows and enviable energy, to analyze the menu and get a feel for the ambiance. This stop-and-gawk continued all evening, much to our amusement. After fawning over the environment, it was time to dive into the deceivingly short menu and choose between three appetizers, three main dishes, and three desserts. We opted for a bit of each with the 55€ carte blanche tasting menu — by far the wisest value given the quality and artistry involved in each plate. The chef has carte blanche and selects the combination of dishes each guest will receive, but he will accommodate food preferences and/or allergies. Following our order, a sommelier advised our wine choice, explaining its origin and why it would produce the perfect sense of balance and harmony with the dishes we would be served. Each course left us more astounded than the previous and had both my dinner companions calling for the waiter mid-meal to book their next visit. I was scheduled to return a mere three days later with my husband to celebrate our three-year wedding anniversary, so the outing with my girlfriends was a welcomed trial-run. We started with the line-caught tuna atop fresh raspberries and tomato water dressed in razor-thin cucumber slices, followed by a perfectly poached egg in a corn puree sprinkled with breadcrumbs and fine parmesan. 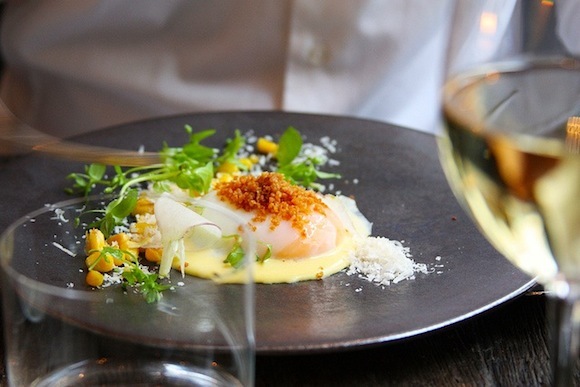 While vegetables are almost always an after-thought at French restaurants, Septime combines fresh, seasonal produce to create refined yet uncomplicated courses from beginning to end. 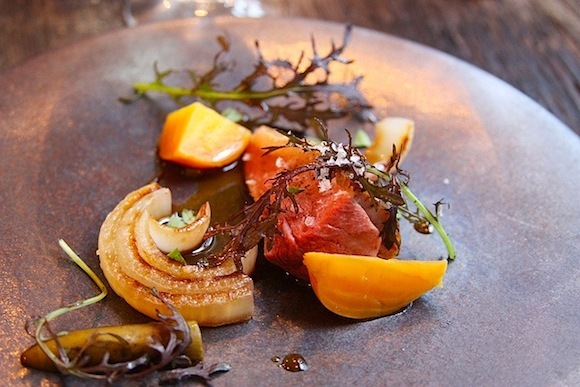 It was the main courses, however, that still have us reeling in delight. Rouget with artichokes and shellfish was served first, but I found it to be overshadowed by the next dish: tender chicken with carrots and yellow beets literally exploding with flavor. When I returned with my husband, we had a wonderful hake fish followed by juicy duck with sweet onions and pickled yellow beets. On both occasions, I passed on the cheese and went straight for the dessert – a mixed plate of rich chocolate ganache, blackberry purée and mint-rosemary sorbet. It was a fresh, sweet ending to a positively irreproachable meal. 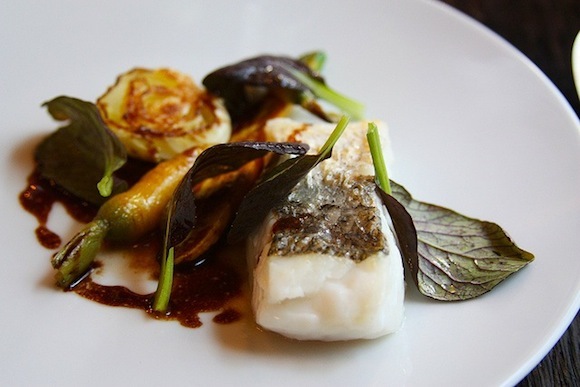 Over the last several years, we have seen more and more foreign chefs set up shop in Paris and breathe life back into an increasingly mediocre gastronomic context. We have also seen a number of French chefs, trained in America and other parts of Europe, bring a fresh perspective to the Parisian food landscape. Bertrand is one of the few who began in Paris and will ultimately flourish here. It’s rare to find a place that masters every aspect of the dining experience – from savors to service, décor to details – but Grébaut and his team of knowledgeable servers nailed the winning formula. The inventiveness that has largely been missing from Paris dining in recent years can be found, without pretention, at his artfully designed and flawlessly conceived Septime. After only four months on the scene, it already has all the visual and symbolic trappings of long-term success. 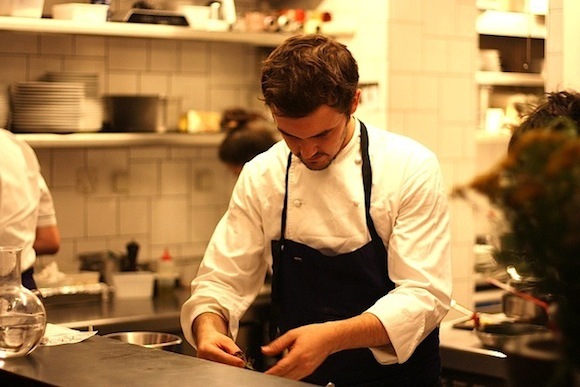 Paris Kitchen writes up Guillaume Delage Jadis Chef’s new restaurant. David Lebovitz also visits Septime. 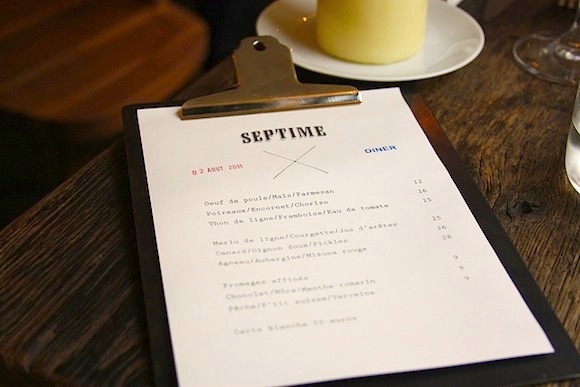 Septime is closed until August 24th, but Paris By Mouth has a list of Paris restaurants open in August. Written by Lindsey Tramuta for the Hip Paris Blog. All photos taken by Lindsey Tramuta. For our amazing rentals in Paris, Provence & Tuscany check out our website Haven in Paris. Lovely blog. Stumbled upon you. This is at the top of my list for next month – I’ve heard so many great things! Miam. Thank you Mardi and Stephanie!! So kind of you to say! Leah, I loved the clipboards, too! Looks like an amazing restaurant.. and what a simple and creative idea to have the menu on a clipboard. Looks amazing Lindsey! I always love your restaurant reviews and this one definitely looks like a gem! Looking forward to trying your recommendation 🙂 and that poached egg should be framed! This looks wonderful! Gorgeous pictures, great writeup. Guess I need to get myself back to Paris! What a fantastic restaurant. Great design and with a maestro at the piano. 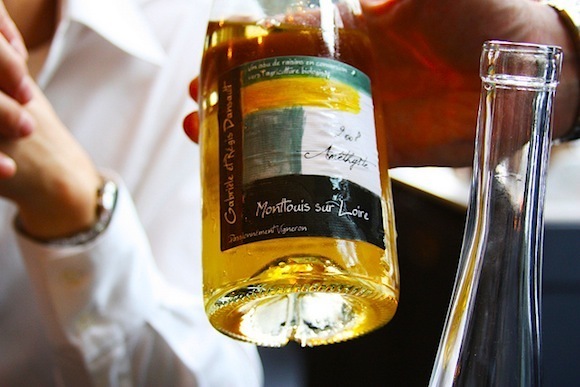 I noticed the Montlouis which is among my favourite dessert wines. It was delicous. I can’t wait to go back. I already booked a table in September! There’s something for everyone at Septime! A marvelous dining expérience! This is on the list for my next trip for sure!